At BALLE’s first annual business conference in 2002, we coined the phrase ‘Local First’, creating a powerful cultural meme and naming a foundational concept of the emerging new economy movement. Since then, the BALLE community has been the driving force behind making ‘local’ a household word. Thanks to this pioneering work, hundreds of communities around the world have launched Local First campaigns, driving growth in local job creation, local entrepreneurship and business ownership, and overall community well-being. But Local First is more than just a catchy slogan. It’s sophisticated work to change our cultural narrative. It has made possible a shift from “there is no alternative” to the idea that a purchase impacts another human being; that there is the possibility of a relationship and real care in our exchanges. 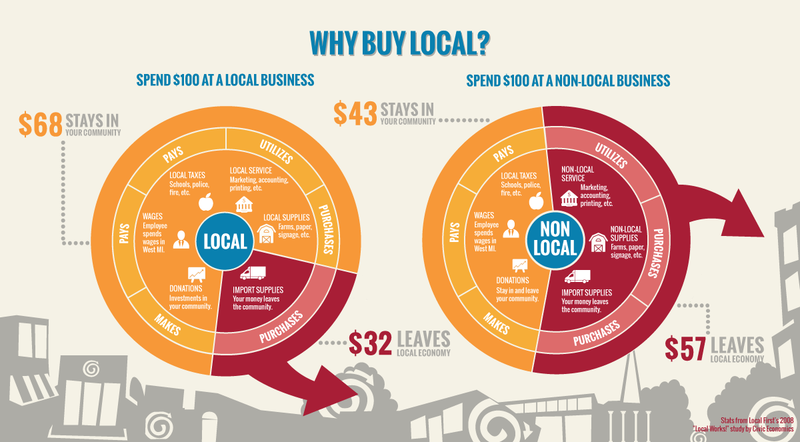 Local First means increasing demand for locally owned, made and grown businesses, goods and services. And it means telling a new story – one where we support local, cooperative and community-owned businesses and each other. Produced in collaboration with our partners at the Center for A New American Dream, the Guide to Going Local is full of ideas and advice on how to strengthen the local economy in your town: through buying local, highlighting new entrepreneurs, instilling local pride, investing locally and more. Read and watch how Buffalo First is reinvigorating the rustbelt economy with Localism. Innovation at neighborhood scale: explore how Urbane Development works with community anchors to build resilient neighborhoods and solve problems that affect everyone’s quality of life. See the impact of Local First with this infographic by Local First West Michigan and this one by LOCO BC. These tips are based on Sustainable Connections’ experience creating and maintaining a campaign that has changed the purchasing behavior of 3 in 5 local households in Bellingham, WA. Do the 10% Shift – Lowcountry Local First shows you how in this fun video, and Local First Arizona lets you calculate your impact on the Arizona economy when you shift 10% of your spending to local businesses. More and more research is being released to support the benefits of locally owned businesses. Here’s one such report from the Institute for Local Self Reliance.